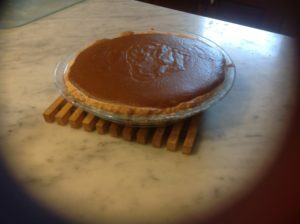 This is a bit more complicated than the recipe on the can of pumpkin but the flavors of the pumpkin and spices really come out. 1. In a 3 quart saucepan add pumpkin, brown sugar, spices and salt, bring to a sputtering simmer over medium-high heat. Cook stirring constantly, until thick and shiny about 5 minutes. 2. Preheat oven to 400. Whisk heavy cream and milk into pumpkin mixture and bring to a bare simmer. Beat the eggs until the whites and yolks are uniform. Add about a third of the pumpkin mixture to the eggs and mix thoroughly, add the rest of the pumpkin mixture and stir about one minute. 3. Immediately pour mixture into the pie shell. Bake on lower rack until filling is puffed and dry-looking, the center will wiggle like gelatin when gently shaken, about 25 minutes. Cool on rack for at least an hour.